SCI Lynn was featured in the Daily Item regarding the 19 AmeriCorps positions available. To read more, scroll down. Place your guess and receive a $20 gift certificate if you can guess which restaurant serves homemade stuff grape leaves? Post your guess by adding a comment. In case you missed it, SCI Lynn Coordinator Trang Le was featured in a recent Daily Item article. Trang does a nice job in the article of conveying how SCI's mission relates to needs and priorities of Lynn. Thanks to the Item for running this positive community story! Community clean-up was a smashing success !! Pictures from the Saturday cleanup! Our April Kick-off clean-up is the first beautification project of Downtown Lynn. 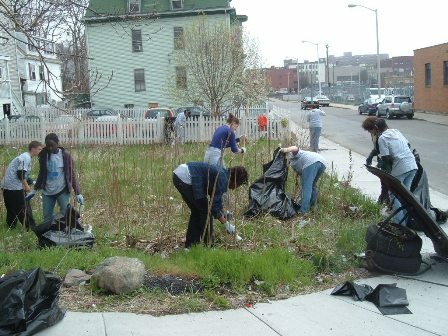 The effort of sprucing up Downtown Lynn businesses will be held on Friday, April 27, 2007, and the residential clean-up will be held on Saturday, April 28, 2007. The theme for the clean-up is, "Lynn – Show the Beauty Within."